The Pastoral Council guides parish ministries. It consists of the pastor and parish administrator, nine members appointed by the pastor to three-year terms, and member one appointed by Pastoral Council. We welcome your support and interest. To view the council minutes, please contact the Parish Center. Each commission is a subgroup of the larger council and is focused on the guidance and development of one part of our parish. Adult Education - Helps parishioners develop programs to enrich spiritual lives, faith experiences, and knowledge of Catholicism. Encourages activities that enable members to continue forming and sustaining their faith. 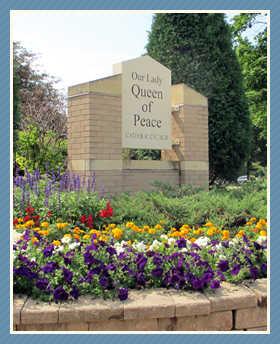 Education - In conjunction with Diocesan and Department of Public Instruction policies and under the guidance of the Pastor and Pastoral Council, devises and implements policies of Our Lady Queen of Peace School. Liturgy - Plans, advises, and supports the liturgical life of parish, including art and environment. Pastoral Care - Identifies and meets physical, social, emotional, and spiritual needs of parishioners through service. QP Community Enrichment/Social Action - Enhances socializing in our faith community through activities for families, couples, and singles. Religious Education (Gr. 1–6) - Identifies and informs the parish of human needs in Madison and beyond, seeks solutions in cooperation with other faith communities, and activates parishioners’ volunteer efforts to help others. Youth Ministry - Develops growth and participation among high school youth in service, spirituality, religious education, and community with the parish, enabling them to live their faith today and always. Buildings & Grounds - Responsible for parish facility needs planning, and current facility maintenance. Campus Information Technology - Creates a long-term technology plan to address campus-wide infrastructure improvements to benefit parish and school. Develops integration into school curriculum. Development - Meets about 10 times a year to research, propose, and evaluate improvements that help parishioners engage more fully in parish life. Long Range Planning - A subcommittee of the pastoral council that monitors ongoing implementation of parish plans. School Endowment - Monitors endowment investments and disbursements and generates increased fund contributions. Find out more about our council members, and learn about our financial transparency. If you have any questions about the Councils & Commissions, contact Lisa Haas, Administrative Assistant, at (608) 231.4600.